San Francisco Celebrates Bonds' Home Run San Francisco celebrates Barry Bonds Day in the wake of the slugger's Tuesday night home run, which broke the career home-run record set by Hank Aaron in 1974. It's "Barry Bonds Day" in San Francisco. The mayor proclaimed it after the Giants' slugger finally broke Hank Aaron's all-time home run record Tuesday night, and fans on Wednesday were still reliving the big moment. With a hometown crowd in a packed stadium, the stage was set for Bonds to make history, and in the fifth inning, he did – by hitting No. 756. Among the cheering fans was Jim Easton of Fresno, Calif.
On Wednesday, as some tried to rain on the celebration with talk of Bonds and steroids, Easton was in no mood for it. "I don't pay attention to it," Easton says. "Let the courts sort it out and let history sort it out. Right now, I just want to live for the moment like he does." Near the corner of Third and King in San Francisco at AT&T Park, about a hundred people are waiting in line at the team souvenir shop — all of them looking to buy memorabilia of Bonds' historic home run. Roland Saavalano of San Francisco has an armful of Giants T-shirts. He's trying to make up for the fact that he missed last night's game. "I tell you, that's the good thing about someone like Barry Bonds getting a record and everyone can celebrate it. Jesus Christ, it's a good feeling," he says. And that feeling will last a while. As the mayor proclaimed the day dedicated to Bonds, he promised that a citywide celebration will come soon. When Bonds came up to the Major Leagues with the Pittsburgh Pirates, he was lithe like a sprinter. By his mid-30s, that physical body had changed dramatically: Bonds looked more like a linebacker, with bulging biceps, a fireplug neck and a massive, sprawling back. Above, he is seen in 1984 at left and in 2004 at right. Barry Bonds of the San Francisco Giants is a supremely accomplished ballplayer with an unmatched hitting eye. He also has an explosive, compact swing, perfectly suited for launching balls great distances. 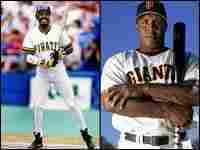 Even before baseball's so-called "steroids era" (starting, in earnest, in the mid-1990s), Bonds was widely considered the best everyday player in baseball. He's a Hall of Fame talent who has excelled over his career at hitting for average, stealing bases, fielding and, yes, hitting for power. Of course, it is the power part that makes so many people uncomfortable, and it's the reason the sports world is paying so much attention to Bonds right now. Home runs are baseball's exclamation points. They are exciting, dramatic and game-changing. Now, Bonds has shattered Henry Aaron's record of 755 career home runs. It's the most important record in baseball. Here's something you should know about Bonds. He is under investigation for perjury by federal authorities. According to the San Francisco Chronicle, he admitted before a grand jury that he used a clear substance and cream given to him by his trainer but didn't know they were steroids. His career path is one of the strangest in all of professional sports. In his late 30s, when the skills of most players start to erode, Barry Bonds became Superman. Before 1999, the year he turned 35, Bonds hit one home run per every 16.1 at bats, a formidable rate comparable to other leading power hitters. Since 1999, he has hit home runs at a pace of one per every 8.9 at bats. That's nearly double his home run output per at bat from prior to the year he turned 35. No one has ever hit home runs at such a clip, and it's a pace Bonds achieved when he reached baseball's equivalent of old age. Barry Bonds came up to the Major Leagues with the Pittsburgh Pirates in 1986, at age 21. He was lithe like a sprinter, known more for swiping bases than slugging home runs. Here is one scout's assessment of Bonds before he started playing Major League ball, according to ESPN.com: "Tall, slender, has reached physical maturity ... He doesn't work much at improving anything and gets by on the ability he possesses in his physical body." By his mid-30s, that physical body had changed dramatically: Bonds looked more like a linebacker, with bulging biceps, a fireplug neck and a massive, sprawling back. These are the kinds of changes in body shape that experts say are consistent with steroid use. According to the book Game of Shadows, by Mark Fainaru-Wada and Lance Williams, the San Francisco Chronicle reporters who linked Bonds to the BALCO steroids lab, Bonds decided to start taking performance-enhancing drugs in 1998. That was the year that Mark McGwire and Sammy Sosa both broke the single-season home run record, the year America became entranced by the long ball. The book says Bonds was irate at all the attention that McGwire, in particular, received. Bonds was 34 at the time. At the end of 1998, he started working out with a childhood friend and personal trainer, Greg Anderson. According to Game of Shadows, Anderson showed Bonds how to inject Winstrol, a powerful steroid favored by bodybuilders. It's the same drug that sprinter Ben Johnson tested positive for at the 1988 Seoul Olympics. Within two years, the book claims, Bonds had started taking designer steroids supplied by BALCO called "The Cream" and "The Clear." And in 2001, Bonds had his greatest single season ever — 73 home runs, an all-time record. The momentum from this late-career power surge put Bonds on pace to become the greatest slugger in the history of the game. Despite the shadows that mar his home-run record, there's no indication that Bonds has ever tested positive for performance-enhancing drugs. And if he did take steroids, he was hardly alone among professional baseball players. When Major League Baseball began drug-testing players for the first time, in 2003 — on a survey basis to determine the extent of steroid use in the sport — it reported that 5 percent to 7 percent of the players tested positive. That may not sound like a lot, but it's enough to fill the rosters of two major league teams. And this April, a former clubhouse attendant for the New York Mets named Kirk Radomski admitted in a federal plea agreement that he supplied performance-enhancing drugs to "dozens of current and former major league ballplayers and associates." Over the years, almost all of the public suspicion about doping in baseball has focused on brawny home-run hitters like Barry Bonds. But what of the pitchers who try to blow their fastballs by them? Some have suggested that pitchers have even more incentive to take steroids, because the drugs can help them recover from the stress that pitching puts on the arm and shoulder. For example, all eight members of the New York Mets organization (minor and major leaguers) who have tested positive for performance-enhancing drugs since 2005 are pitchers. That's just one team, but it suggests that pitchers are part of the problem, too. And it can be fairly argued that any advantage a hitter on steroids enjoys is offset when his counterpart on the mound is doing the same thing. So how baseball fans have reacted to Bonds setting the home-run record has depended on which slice of truth about him they prefer to see. You can focus on Bonds the hitting genius and clap loudly with two hands. Or you can dwell on Bonds the suspected cheater and sit on your hands and boo. Or maybe you take it all in — the good, the bad and the ugly — and then what? What's the sound of America's baseball fans clapping with one hand?